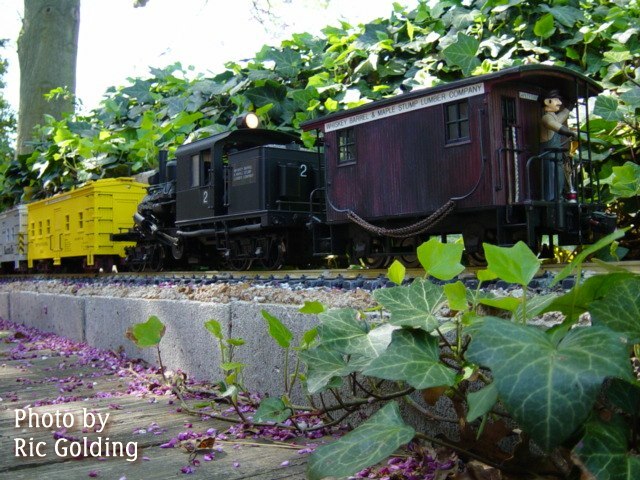 When LGB trains reinvigorated the Garden Railroading hobby, resources were few and far between, misinformation was everywhere you looked, and many of the early pioneers of the hobby were separated by hundreds of miles from each other. So, the few people who knew how to use the Internet before the World Wide Web came online figured out ways to find and talk to each other online. One of the earliest and best resources was the Big-Trains mailing list, whose members included experts of all sorts and a growing number of newbies who gradually became experts in their own rights. For those of you who think the Internet started in 1995, a mailing list is a pre-web way to support interaction between people with similar interests. When you sign up for an e-mail mailing list, you agree to receive e-mails from anyone else on the list. To send comments to the list, you e-mail the list-server, which forwards your comments to all of the other subscribers. If you reply to someone else's comment, you can usually choose to e-mail the person directly, the whole list, or both. Most local hobby shops were fountains of misinformation. Although Garden Railways magazine was a valuable resource, folks who had questions couldn't always wait until Marc got around to publishing an article on the subject. Most clubs were in their infancy, and often hampered by misinformation themselves. The books on the subject were not always helpful - one was largely a refitted "indoor" railroading book with photos of LGB trains where the HO trains were before. One Place for Good Answers - In this vaccum of reliable, useful information, the Big Trains mailing list stood out as a source of legitimate, timely, real-world information and advice. I found my way here when I was still in the "clueless newbie" stage. I learned quickly that I could ask a legitimate question and get several thoughtful answers, all of which were worth evaluating to see which approach was best for me. As the list grew and as new members gained experience, we began helping the next generation of "newbies." Attempts to Settle Big Questions - We also discussed difficult subjects like scale and gauge ratios, coupler height standards, and flange depths. In some cases, those discussions got a little heated. But generally, the problem was either misinformation or folks coming at the same issue with different needs and agendas. With the help of many Big Trains members, we collected and published the facts that nobody could argue with. On matters of personal preference, we generally agreed to disagree agreeably. In a few cases, the major manufacturers paid attention when we were able to achieve consensus on some topic. As an example, getting manufacturers to label the scale of their products was largely the result of several years' efforts on the part of Big Trains members. The Big Trains members also have helped develop resources that answered some of the hard questions once and for all. Several of us, including some manufacturer's representatives we pulled in to make certain we had the facts straight "sweat blood" over the contents of articles such as "Which Scale Should I Model". By the time we were done and the major manufacturers had all approved the content as it related to their products, we had put an end to 90% of the arguments on the subject. By now, many of the ideas from discussions on the Big Trains list have worked their way into articles in Garden Railways magazines, as well as articles on public web sites such as Family Garden Trains and Large Scale Central as well as articles on some subscription-based sites such as My Large Scale and Large Scale Online. As such resources grew, the amount of traffic on the Big Trains list has shrunk - hardly anyone signs up any more and asks questions like "tell me everything I need to know about garden trains." But when a good topic for discussion comes up, folks still come up with some pretty good answers. We're Still Here - Though the Big-Trains list is not nearly as critical to the growth of the hobby as it once was, many of our old friends from the "early days" hang out there, many new friends have joined, and it's still a good place to bounce ideas around. There are also some "running gags" - jokes that go back ten years, such as Carl (Vic) Vogel's supposedly split personality (which rumor started because some folks knew him as Vic and others knew him as Carl). Please pardon us if we don't exactly take ourselves too seriously . . . . So here is an invitation to join the club. Introduce yourself, and tell us what your specific interests are, than ask any specific questions you have as they come up during your ordinary progress in the hobby. If it's a legitimate question, you may get five good, but different answers, and it will be up to you to decide which answer works best for you. 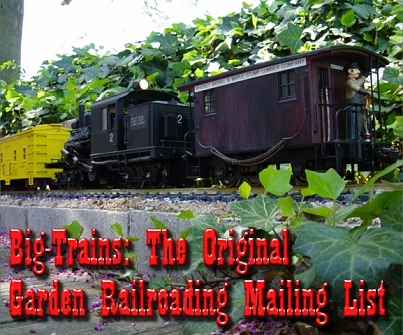 If you say "Tell me everything I need to know about garden railroading," you might be disappointed, though. Big Trains Frequently Asked Questions - This page answers your questions about what a mailing list is and what is unique about the Big-Trains mailing list. Big Trains Archives - Look for old postings or old remarks by old friends. Search by field is disabled for now, but you can scroll backwards as far as you want.